I joined here a few years ago and decided to return. 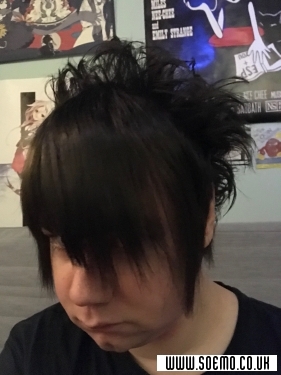 I’ll be perfectly honest I’m much more into the fashion side of emo than the music part but I still dig some of it :3 I like video games, anime/manga (though I don’t watch/read nearly enough of it) Emo/alternative fashion and cars. Nine Inch Nails, Indochine, Depeche Mode, Squarepusher, Polysics, Caravan Palace, Green Day, Mindless Self Indulgence ... there’s far more but they’ve slipped my mind for now. Thank you for the pic comment. That was me with a little more weight on. I'm glad it's getting good reception. But you're always cute. If I was a bit shorter I would definitely come over to you. I'm doing OK, but only OK. Motivations the goal, and I'm not putting the effort in. I'm a total procrastinator. Wah! I just want to be perfect!!! Bit of both really. Just when I get time which isn't that often! Yes it has the standard wheels. Heya I'm fine thanks just at work. The Integra is doing well. Gave it a good clean yesterday :) how are you? No via a Japanese import company.